If the summer heat has you craving California rolls, then look no further than your own kitchen—making sushi from scratch isn’t as hard as you might think. We sat down with Mari Takahashi, chef/owner of San Francisco’s Nombe Restaurant, to learn more. Although the fish gets all the glory, Mari says that rice is actually the key to good sushi. She recommends using short or medium grain rice—restaurants typically use the Nishiki brand—and washing the grains 4–5 times before cooking them. You’ll want to give the rice ample time to “rest” between stages, says Mari: Let the rinsed rice sit for 20 minutes before cooking (recipe here), then let the cooked rice to sit for 20 minutes before use. You should also adjust the ratio by season. Rice growers harvest the new crop every October/November. Since this freshly harvested rice contains more water, you won’t need to use as much water to cook it. As the year wears on , you’ll want to add progressively more water to compensate for the drier grains. Buy fish from a trusted source, such as Whole Foods, or your local fresh fish market, says Mari. Some Japanese markets sell sashimi that has been cut into small chunks (saku), which work well for sushi. Of course, you’ll want to use the freshest fish available. To gauge a fish’s age, carefully inspect the fish. If you’re buying tuna, color is key: red tuna is fresh; bright pink tuna is old. Avoid any fish with a rainbow sheen; that means the fish is old. If you’re buying the fish whole, look closely at its eyes. If the eyes are clear and watery, the fish is fresh. Still not sure about that salmon? Give it a squeeze: any fish that feels firm to the touch is fresh. Once you’ve prepped the rice and fish, you can play with fillings. Mari recommends adding crunchy items, like cucumber, radish, celery, or jicama, to give your roll texture. 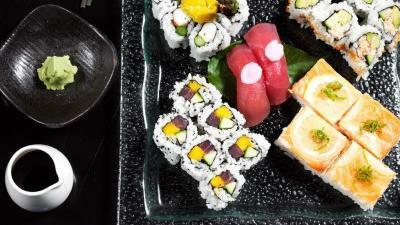 But don’t limit yourself to veggies—tempura, sesame seeds, and tobiko also work. Fruit can also complement the fish; Mari likes pairing salmon with mango, eel with papaya, and halibut with pickled plum. If you aren’t sure what to add, try avocado. With its buttery texture and mild taste, avocado tastes great with almost any kind of fish. High-quality seaweed is thicker than cheap nori, so it’s less likely to break when rolled. Plus, the taste of the seaweed will affect the taste of both the rice and the roll itself. As with fish, you can judge seaweed by color: bypass bright green seaweed in favor of darker varieties; the best nori appears almost black in color. You can also tell the difference in the taste. “Good nori tastes like the flavor of the ocean,” Mari says. To make your own, buy dashi at a Japanese supermarket, or make the dashi using Kombu seaweed, bonito flakes, iriko, and dried shiitake mushrooms. Then mix 3 parts dashi to 7 parts soy sauce, and voilà! You have the perfect dipping sauce. Finished making your maki? Eat it right away—sushi tastes best fresh.